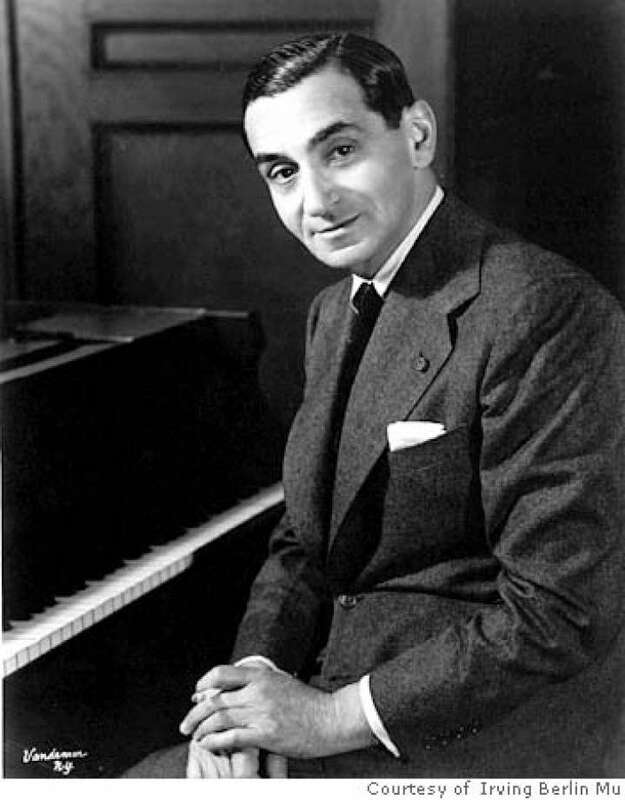 Irving Berlin was born Israel Beilin in Russia and emigrated to the U.S. with his family at the age of five. He had to go to work at a young age to help provide for the family by selling newspapers and singing songs for coins, and eventually working as a singing waiter at the Pelham Cafe in Chinatown at the age of 18. There he sang made-up "blue" parodies of hit songs of the day to the delight of customers, taught himself to play the piano, and wrote his first song for which a printing error gave him the name “Irving Berlin" (which he kept). In 1909 Berlin got a job as a staff lyricist with the Ted Snyder Company, and, in 1911, wrote his first hit song, "Alexander's Ragtime Band". This worldwide phenomenon gave him instant fame and led to a 6 decade music career during which he wrote more than 1000 songs, being one of a select group of composers who wrote both the music and lyrics. In spite of his famed musical career, Berlin never learned how to read or write music beyond a rudimentary level and would always create his written musical scores working with a music professional. When asked about his method of songwriting, Berlin replied, “Usually I compose my tunes and then fit words to them, though sometimes it's the other way about. It's the lyric that makes a song a hit, although the tune, of course, is what makes it last". In 1914 Irving Berlin was a founding member of ASCAP (American Society of Composers, Authors, and Publishers), and championed many music copyright causes during his musical career. Indeed, in 1961 he sued Mad Magazine for copyright infringement in publishing a parody of his song “Blue Skies”. The case went all the way to the United States Supreme Court which let stand the lower court ruling in favor of Mad Magazine. This resulted in a principle carved out of Intellectual Property law, known as "The Mad Magazine Exception", establishing parody as protected speech. Berlin wrote the songs "What'll I Do", "How Deep Is The Ocean", "Cheek To Cheek", and "I've Got My Love To Keep Me Warm" for 1930's films and many were sung by the performers Kate Smith, Ginger Rogers, Fred Astaire, Al Jolson, Bing Crosby, Judy Garland, and Alice Faye to name a few. Additionally, he contributed to the Rodgers and Hart musical Betsy (1927) with his popular song “Blue Skies”, the Burlesque show The Whirl of the World (1911) with the famous “Alexander’s Ragtime Band”, and the Armistice Day Radio Broadcast (1938) where Kate Smith introduced his immortal song “God Bless America” which he had written years earlier. When Jerome Kern died after accepting to write for the Broadway Show Annie Get Your Gun, Irving Berlin was asked to step in at the last minute. He immediately accepted and within the month he had written the show's entire score including the song standards "The Girl That I Marry", "They Say It's Wonderful", and the immortal "There's No Business Like Show Business". On the occasion of his 100th birthday in 1988, a gala birthday bash involving the major entertainers of the day celebrated Irving Berlin's century of life. On the day following his death in 1989, a crowd of thousands sang Berlin's "God Bless America" at a luncheon in Boston. On the evening following his death, the marquee lights of all Broadway playhouses were dimmed before curtain time in his memory.